It has been many years since I found a Shaggy Mane mushroom. I was 22 and living in Washington Crossing, Pa. We were driving through the nearby town of Yardly and stopped for a traffic light. There by the side of the road I spied one perfect Shaggy Mane. We didn't dare to eat it even though we were quite sure of our identification as nothing else I know of resembles this mushroom. My great uncle Nat, who founded the New England Mycological Society, taught me how to identify morels, chanterelles and the more rare shaggy manes, and had it been a morel or even a chanterelle I would have trusted it but somehow shaggy mane had me nervous. Two days ago,my husband Elliott, who was doing yard work, reported that there were many mushrooms around and that I should lose no time in checking out the white conical ones in front of the house. I stopped what I was doing on the computer and raced right out into the fall leaves. There it was--one large one with it's bottom fringe already showing a bit of black, and several smaller ones. Luckily, my cousin Marion Bush, who is this generation's expert in wild edibles (the name of her busines, which supplies local restaurants, is Wild Harvest) was home. I sent her a photo from my new Iphone 5 (love it!) and she identified it as a true Shaggy Mane. She recommended sautéeing them in butter with a little chopped onion and thyme. She added that these mushrooms hold a lot of water, so I got out my new Rose™Line crêpe pan, reasoning that it's exceptionally flat surface would speed evaporation. I also uncorked a great bottle of Austrian pino and we had a succulently delicious pre dinner appetizer! Note: In many small towns in France the pharmacist also is the local mushroom expert and people are encouraged to bring their wild mushrooms for identification. Lacking this, it is strongly recommended to be 100% sure of identification or to bring it to a trusted expert. 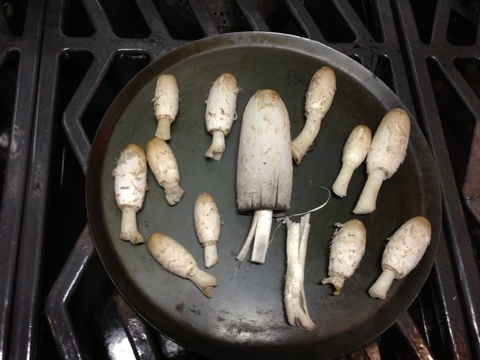 If a poisonous mushroom (the spores) comes into contact with an edible one, the edible one also will be contaminated.